Commander Zeita Merchant (also Dr. Merchant) is a 1998 graduate of Tougaloo College, where she earned her B.S. in Biology and joined the United States Coast Guard in 1997, through the College Student Pre-Commissioning Initiative (CSPI) Program. Enjoying over 17 years of active duty service, CDR Merchant is a recognized authority in the complex and rapidly changing marine safety and environmental management field. CDR Merchant currently serves in the Office of the Commandant at Coast Guard Headquarters in Washington, D.C., where she provides direct support to the Commandant and the Vice-Commandant of the United States Coast Guard. As the Special Assistant to the Vice-Commandant and member of the Commandant's staff, she serves on a highly dedicated and functional team that works across the enterprise to ensure adequate and accurate information flow to support strategic, operational, and tactical decisions required of the service's top two principal leaders. Before her assignment to Washington, D.C., CDR Merchant served as the Executive Officer of Marine Safety Unit Texas City where she led over 120 Coast Guard members in the performance of numerous marine safety and response missions in the nation’s largest petrochemical port complex. CDR Merchant also served as a Military Congressional Fellow on two U.S. House of Representatives’ Committees in Washington, D.C. from 2010 to 2012. During the 111th Congress, she employed her multifaceted expertise in guiding legislation that governed the Coast Guard and maritime transportation activities on the Committee on Transportation and Infrastructure. At the start of the 112th Congress, she was selected to serve as a Fellow on the Committee on Oversight and Government Reform where she supported the committee's oversight work on fraud, waste and abuse in the federal government. 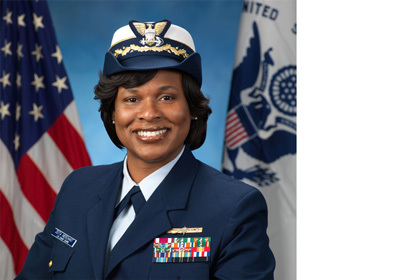 From 2005 to 2008, CDR Merchant was stationed at U.S. Coast Guard Sector Miami where she served as Supervisor, Port of Miami Field Office and Chief, Port Operations. During this time, she led Sector Miami’s port operations at three of the largest ports along the Florida Eastern Seaboard. In addition to her degree earned at Tougaloo, CDR Merchant was conferred the Master of Quality Systems Management from the National Graduate School in 2003; the Master of Public Administration from George Washington University in Washington D.C. in 2010; and a Doctorate in Business Administration in June 2011. CDR Merchant has been honored with countless professional, academic, and community service awards, including the 2014 Black Engineer of the Year (BEYA) Professional Achievement in Government Award, 2011 BEYA STEM K-12 Promotion of Education Award, the 2010 Annual MEAC/SWAC Challenge Legends HBCU Trailblazer Award, and the 2010 Coast Guard Award for Excellence in Diversity. LCDR Merchant’s personal military awards include a Meritorious Service Medal, two Coast Guard Commendation Medals, three Coast Guard Achievement Medals, two Military Outstanding Volunteer Service Medals, and four Commandant's Letter of Commendations.